Pergamum, (105 kms north of Izmir)~~ is one of the major sites antiquity in Turkey, having been a great center of culture and civilization throughout history. The site has remarkable remains from the Roman and Byzantine periods. The Asclepion to the southwest of the lower city, was built to pay homage to the God of Health, Asclepios, and it was the most celebrated in the world. The temples of Trajan and Dionysus, majestic Altar of Zeus, the temple of Demeter, inspiring theatre, the gymnasium, the arsenals, the lower agora and the famous library form the Acropolis. In addition, you may see the finds from Pergamum and the surrounding area. In the Archaeological and Ethnographical Museum. The temple of Serapis, also called the "Red Courtyard" due to its red tiles, is today located within the town of Bergama. It was built as a sanctuary dedicated to Serapis and was then converted into a basilica by the Byzantines. Bergama is the homeland of many philosophers and scientists. Among them is Krates who invented and produced the "parchment paper" (Pergamene Kaste) here. Dikili is a harbor town close to Bergama, visited by cruise liners bringing visitors to Pergamum. Dikili is an ideal place to relax after a Pergamum excursion. A walk along the Rordan promenade is a pleasure. Between Dikili and Izmir do not forget to visit the port of Candaril which is crowned with one of the best preserved Genoese fortresses . Cesme is a little town at the tip of the peninsula that forms the Gulf of Izmir. The meaning of "Cesme" is "fountain" or "spring" due to the curative springs and thermal baths around especially in Ilica. Cesme and Ilica are resorts that should be visited for a while because of the vast white beaches and azure waters with seasonal accommodation facilities. Ilica is located at the center of several touristic sites. Thermal resorts of Sifne Pasa Limani, Buyuk Liman, Alacati, and the Bay of Boyalik. You may enjoy almost every kind of water sport in Cesme, including underwater diving. If you are lucky enough you may encounter the seals, off the shore. In this town, there are excellent accommodation facilities and an attractive night life. Cesme Castle now houses the International Cesme Sea and Music Festival. The Cesme Peninsula has many seaside resorts. At the northeast of Cesme lies lidin which was the important port of Erythrai, founded after the War of Troy, and it has a good view from the acropolis, overlooking the bay and the islands . Urla (Clazomenae) is a peaceful place to visit and to taste the delicious fish at a local seaside restaurant. The view from the Guvendik Hill is always relaxing. The road between Izmir and Cesme is dotted with lovely little fishing villages such as Mordogan which takes its name from the particular purple color of the sunrise at that spot and Karaburun an unspoiled village nestled between the mountains and picturesque bays Balikliova. On the southern part of the Peninsula is Seferihisar an important yachting center surrounded by Geneose remains. From here you may visit the ancient city of Teos to see the impressive Temple of Dionysus, or to lose yourself to the warm sandy beaches of Altnkum. Gumuldur will also tempt you with its beautiful beaches full of tranquil bays, which you may consider as your own, with excellent accommodation, discos and restaurants. The colossal statute of Apollo in the Temple of Apollon at Ahmetbeyli (Claros), should not be missed as it is an amazing piece of art. An attractive site with a mysterious nature is Foça, a legendary place interesting sights. Here is the fascinating Siren Rock Island, where the action of the soft wind blowing through the rocks make sounds resembling a woman's cries. These unearthly sounds, once allegedly spell bound sailors to stay on this land until their death. Foça is the ancient Phocaea of the lonians, and is supposed to have taken its name from the "fok" which are the Mediterranean seals that inhabited this distinctly peculiar rocky ground. Reflecting the bright history of the region, several monuments exist, including a tomb of a Persian King, and another called "Seytan Hamami" (Devil's Baths) at the foot of the Candede Hill. Here, the natural beauty is combined with these historical assets, making Foça a charming touristic site. Today, the town is a lovely holiday village with green covered land meeting the clear blue sea. The numerous modern facilities established around the clean beaches offer visitors a wonderful vacation. A special event for divers, is the Underwater Sports Festival held in the region. Ephesus proudly houses one of the seven ancient wonders of the world; the Temple of Artemis. The city is dedicated to her and has many fascinating buildings. The precise date of the city's foundation is not known but legend said that the first Efes was founded by Women Warriors of the Amazon in the 14th century BC and later inhabited by lonians in the 11th century BC after the first settlement of the Anatolian's natives, the Lelegians. In a short time the city became very important. After 133 BC it became a Roman province and during the reign of Augustus it became the trade center of Asia. With all these civilizations passing through Ephesus, the remains take one or two days to visit fully. The city still retains its importance, but this time as the most important archaeological and historical city in Turkey. One of the very amazing ruins in Efes is the huge amphitheatre with a 24,000 seat capacity and superb acoustic effects. Seljuk is close to Efes and is crowned with a Byzantine citadel and the basilica of St. John. Next to the basilica is the Seljuk Isa Bey Mosque. The Seven Sleepers' Cave is another historical place near Efes. The archaeological museum is significant with its striking collection of items gathered from the excavations in Ephesus. Every May there is an International Festival in Efes. On Bulbuldagi (Mt. 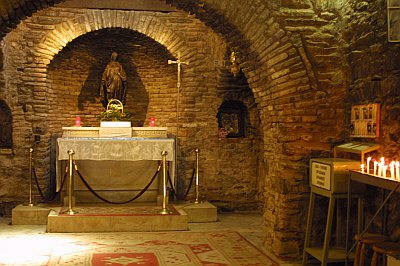 Nightingale) one can find the small house built for the Virgin Mary (9 kms from Seljuk) when St. John brought her to Ephesus after Christ's death. She spent her last days in that house. Today it is a place of Pilgrimage for Christians and also visited by Muslims, and is officially sanctioned by the Vatican. Every year on August the 15th, a commemoration ceremony is held there. City on the Aegean coast of Anatolia, just north of Ephesus. Izmir is the third largest city in Turkey. The modern city was mostly rebuilt after a 1922 fire which destroyed three quarters of it. --- ibn Chaka.....................................1092-1097 d. ?